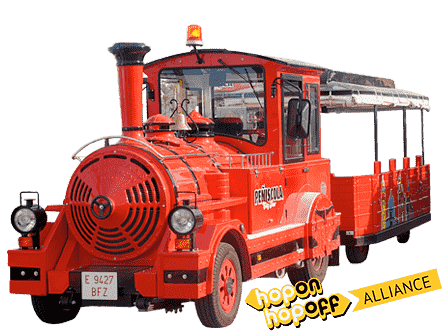 The Peníscola City Tour offers a three-wagon articulated train designed to offer great visibility so riders can take in the best views of the city as they enjoy a pleasant journey. Our train has an individual audio system in 7 languages: Spanish, English, French, German, Italian, Portuguese and Russian. The vehicle has 52 seats and includes a space adapted for persons with reduced mobility. It also features curtains so you can continue enjoying the ride if it rains. Daily service all the year. Departures from Avda Papa Luna 5, 26 and 96. Also in Calle Llevant 1, next to the fishing port and castle.